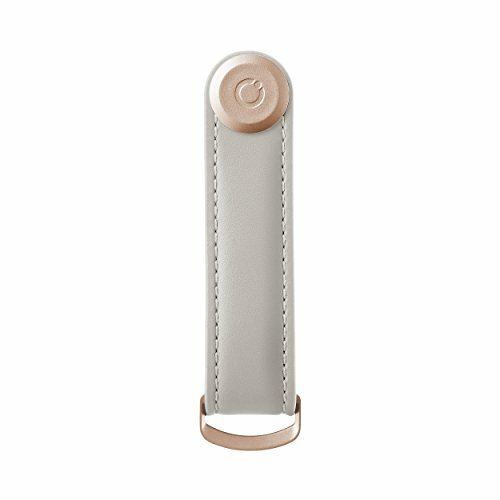 The Orbitkey Key Organiser was launched in 2013 and refined once more via crowdfunding platform, Kickstarter. What started off as a side project for two blokes to transform their own messy bundle of keys into a beautiful and silent stack, has now turned into a mission to provide clever organisation solutions for better living. The Key Organiser is fully customisable, accommodating between 2-7 standard keys, alongside add-on accessories such as the 2.0 bottle opener and USB. For bulkier items such as car keys and apartment fobs, the included D-ring attachment can be used. You can now say goodbye to jingling keys, scratches on phone screens, damaged wallets and holes in pockets and welcome your new everyday carry essential! Care instructions: Wipe down with soft dry cloth, limiting its exposure to direct heat or intense sunlight. Silent Keys - No more noisy keys. A perfect companion for your next run, hike or commute. Special Rose Gold Locking Mechanism - Flexible, yet secure mechanism to carry 2 to 7 keys and will not loosen unintentionally. If you have any questions about this product by Orbitkey, contact us by completing and submitting the form below. If you are looking for a specif part number, please include it with your message.